Below is a list of some courses I found intresting and curated in this list. Penetration Testing Tutorials For Beginners - YouTube - This is a hand-curated playlist on Youtube by me. This list contains simple beginners tutorials that can help you learn penetration testing using Metaspoilt. Ethical Hacking & Penetration Testing - Complete Course - YouTube - This is a full course that contains many aspects of ethical hacking along with penetration testing using Metaspoilt. Web Application Penetration Testing - YouTube - This course by TutorialsPoint covers web application penetration testing using various tools like NMAP, Metaspoilt and more. Complete Kali Linux Tutorial For Ethical Hacking (Web Application Penetration Testing in Kali Linux) - YouTube - This tutorial is focused on penetration testing using Kali Linux and various tools including Metasploit. 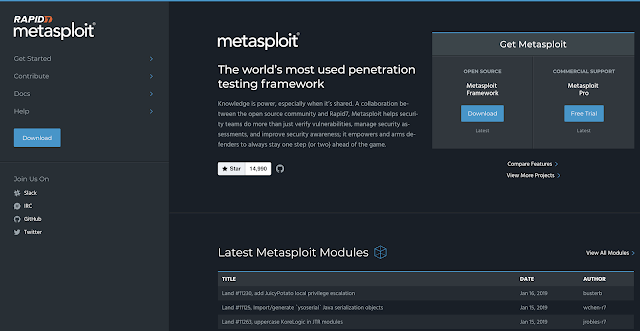 Ethical Hacking with Metasploit the Penetration testing Tool - YouTube - Learn to become a hacker using Metaspoilt penetration testing with this course. Metasploit Course 2018 - YouTube - A simple 2-hour course from an expert Metaspoilt user. Introduction to Metasploit for Penetration Testing - YouTube - Another short course to learn Metaspoilt penetration testing and ethical hacking. Beginning Metasploit tutorial - YouTube - A very short beginners tutorial by Packtpub on Metasploit. Web App Penetration Testing - YouTube - This course on youtube is focused on doing web application pen testing.